Altenew has a fun set just for cardmakers called Crafty Friends. Love it! Sentiment stamped in Versafine black and clear embossed onto a watercolored panel. Made the panel by coloring the inside of an embossing folder with markers in a rainbow pattern. Spritz the watercolor paper and then insert, close, and press with hands. MOOD WHEN DONE = Happy! Looking forward to the weekend. Our son is visiting! have fun with your son this weekend - think i need that stamp - love your card with the pretty background! Love that card - I need to try that background technique. Enjoy your family time. Great card. 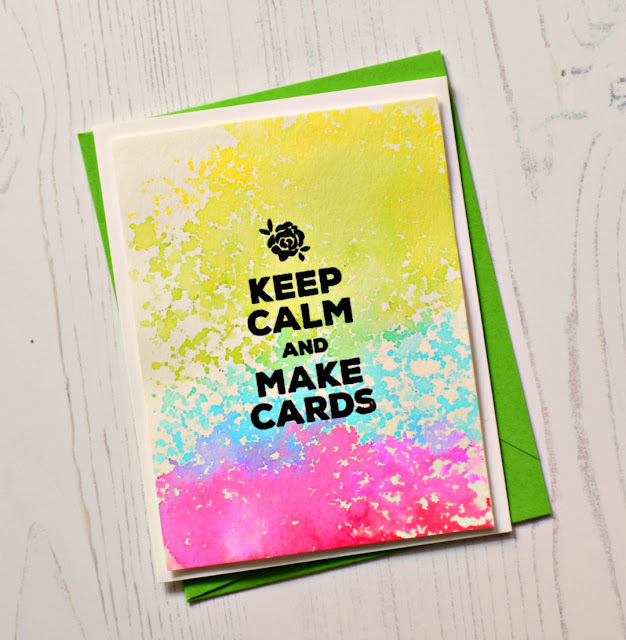 Love the idea of using an embossing folder to distribute color on your card. Am definitely going to give that a try. And there is nothing better than your kid coming home for a visit. ENJOY! What an interesting and fun way to make a watercolor background. Who would have thought? I'm making a note of this. Fantastic stamp set (had to peek). Love the bold sentiment against all that color. Hope you've been having a nice visit with your son. I love when ours comes down for the weekend and I get to play Mom.